This time last year, Albuquerque-trained Jordan Espinosa (7-4) had just suffered a unanimous decision loss to a 145-pound fighter despite his natural fighting weight being two weight classes lower at 125-pounds. The Flyweight competing against a Featherweight left Kentucky with a record of 4-4, an even .500, and looking for some sort of consistency in his young MMA career. Fast-forward just less than a year later and Jordan Espinosa is no longer at a crossroads fighting in desperate conditions trying to stay afloat with a winning record. In fact, Jordan Espinosa may be one of New Mexico’s most valuable and talented prospects. Before we get into Jordan’s last twelve months as a professional mixed martial artists let me explain the usage of the term “valuable” in this story’s context. Jordan is a young competitor, 25-years old, several years away from the time period many consider to be the “prime” years of an athlete’s life. Jordan trains with one of the marquee gyms in the State and has already traveled around the country competing and has mixed it up with some extremely talented opponents during those travels. Contrary to other fighters with comparable or even exceeding exposure, Espinosa has strayed from the padding record approach and instead has opted to take on some formidable opposition. 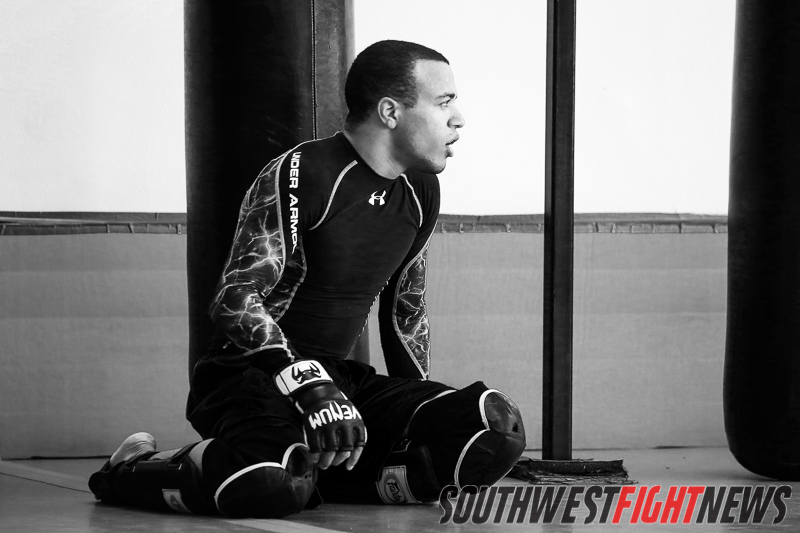 A young, experienced veteran of the sport with impressive talents ranging from quick takedowns to suffocating chokes (three Brabo Choke victories and one north-south choke victory) and from speedy strikes to explosive high-flying attacks like flying knees and kicks, Espinosa is hard to hit and a blur when he starts to get into a rhythm inside the cage. 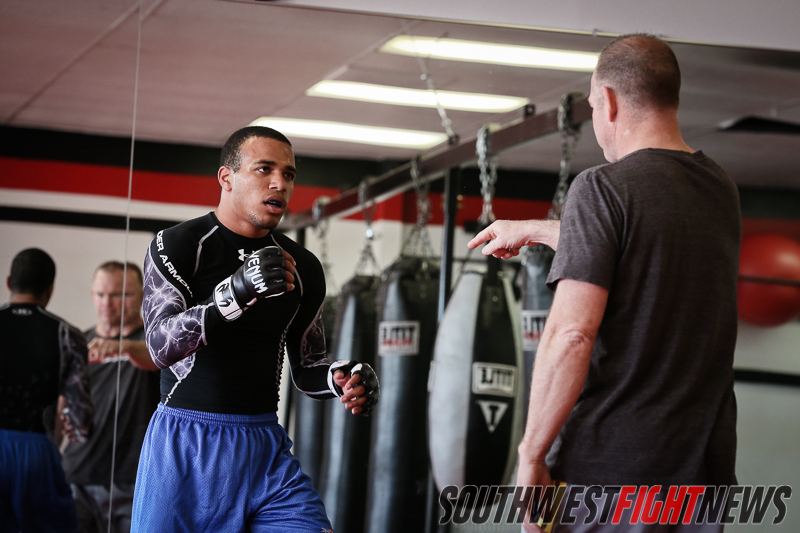 If the Southwest area is looking for a top talent, up-and-coming and ready to emerge as the next standout fighter from talent rich region, you would need to only look over in the direction of Luttrell MMA’s Jordan Espinosa. The loss to Chris Dunn would be the last time Espinosa has tasted defeat and since has been on a tear. After taking the unanimous decision against Jeremy Pender, Espinosa was scheduled to take on undefeated top prospect Rafael “Barata” de Freitas who would enter the cage as a touted grappling World Champion, a Brazilian Jiu-Jitsu Black Belt, a participant in the qualifying round of the Ultimate Fighter and one of the area’s most notable fighters. Espinosa would enter the cage a relative unknown, a marginal underdog and a long-shot to leave the Legacy FC event with the biggest win of his career. To the show of many, at the conclusion of their October 2014 bout, Espinosa’s hand was raised and the undefeated aura of Barata was gone. Chalk up this author as one of the few willing to bet on Espinosa despite most fight fans writing this off as a Barata victory. Espinosa had the right tools to beat Barata and Barata had a blueprint available to any opponent as to how to beat him; Josh Montoya started it in 2011 and TUF contestant Cody Bollinger showed some more of it in 2013. However, it was Espinosa in 2014 that went the distance with Barata and fought the talented Brazilian on the feet and on the ground in a grueling bout that saw both fighters end round three exhausted. Espinosa was too fast, connected with strikes continually and fought off all the talented grappler’s submission attempts. It would mark the biggest win of Espinosa’s career as Barata was considered one of the best unsigned talents in the area and was thought to be knocking on the UFC’s Flyweight Division’s door. The bout saw Espinosa consistently outland Barata in the striking while defending the accomplished grappler’s attempts to wrap him up in the clinch. The scariest moment of the fight for Espinosa came in the third when Barata snatched up an arm-triangle of which Espinosa fought off for an extended period of time. While Espinosa survived a desperation submission attempt from a World Champion submission artist, he nearly lost a battle concerning his own health weeks before he stepped into the cage that night. Espinosa was correct; the opportunity was one of great significance for his career trajectory. 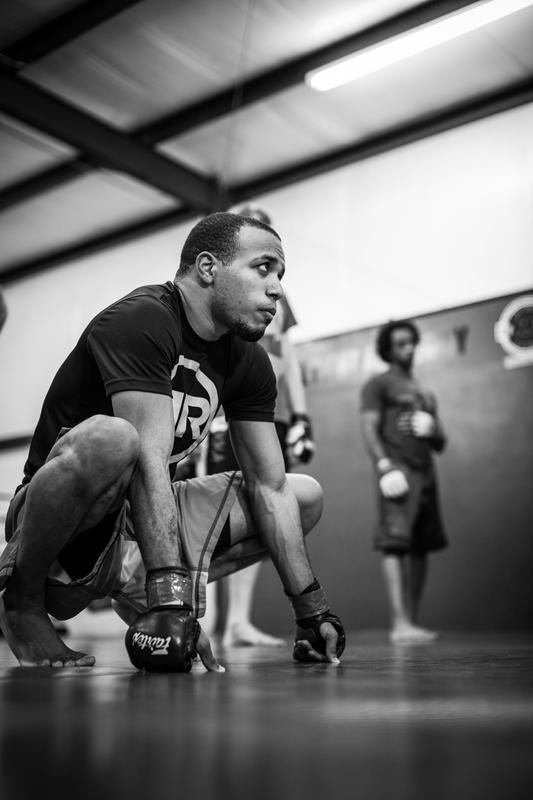 He had momentum on his side and had spent the fight camp knowing that this one fight could change his fight life going forward and open up new doors that may have been previously unavailable to him. That moment when Espinosa was able to communicate to his parents on the biggest stage he had ever stepped upon was a true indictment to the dedication he puts forth into his training. Espinosa trains at Luttrell’s MMA in Albuquerque, an area where he is void of any family members as most of Espinosa’s family resides in other areas in the country. Espinosa is here in New Mexico for one reason and that reason is to train for combat sports and improve his talents while climbing the ranks. Espinosa’s next opportunity to make his family proud has just been announced and while the announcement means Espinosa will be back in action, it wasn’t the opponent the young talent had already set his sights on. Despite some banter on social media and in interviews, Espinosa didn’t get his wish and will now have to wait for the match-up to happen. Back in February, Jackson-Wink fighter Nick Urso won a hotly contested bout against Josh Montoya, a fighter Espinosa trained with extensively. Urso has been a fringe top prospect for a few years and saw his opportunity to make it to the UFC curtailed last year when he was outclassed by FIT NHB’s Ray Borg, the young Phenom who is now considered one of the Top 15 Flyweights in the world. Urso’s win over Montoya was supposed to be a statement victory that would help Urso rebound back into the prospect category. While the bout was held with high anticipation, the action and conclusion was seen by many as a let-down as Urso seemed content to win the fight on points despite cutting Montoya and wearing his cardio out over the course of the three round affair. After the bout concluded, Espinosa used social media while still inside the venue to state his intentions. “I want Nick Urso” was the term used by Espinosa who shared a seat to the right of this writer the night of the event. It was exciting. 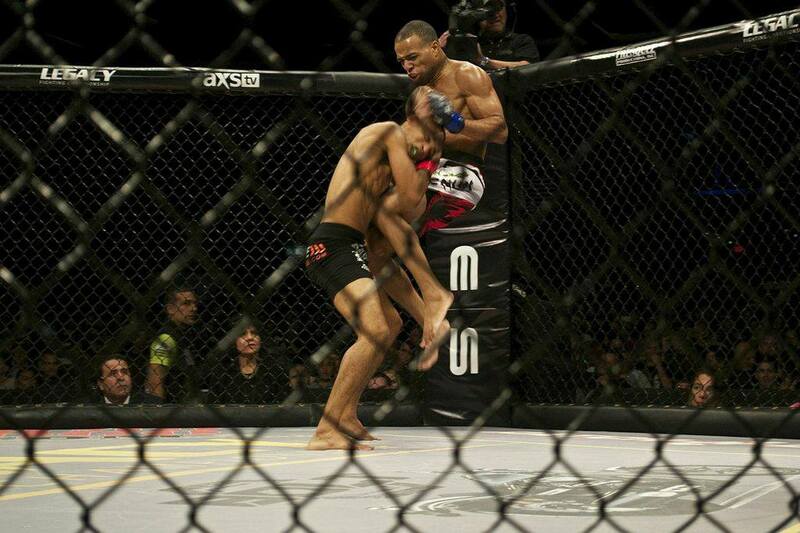 A fighter from this area showed some showmanship and actually made an exciting moment outside of the cage. However, the callouts would not end that night. Some may view this statement as abrasive but it is exactly what the area’s fight scene needs. Whether this fight happens or not, it is a breath of fresh air for a local athlete to take to social media and the media in general to generate buzz in the area. Buzz is disappearing in the local fight scene and a huge reason for that is the lack of excitement to come from our local athletes. A potential clash between Urso and Espinosa would be of great significance to the area. Similar to the bout between Urso and Borg, the winner of the bout would be propelled at an increased rate up the metaphorical ladder towards the big stage of MMA. Would Urso take the fight considering his last step-up in competition led him to a set-back and would Espinosa have the ability to once again rise to the occasion and capitalize on a career defining opportunity? If the fight doesn’t end up coming to fruition, Espinosa doesn’t have any other specific targets on the radar. With bad intentions of spoiling hometown performances, Espinosa takes on a villainous role, one that might label him as one of the most noted fighters in the area. New Mexico has plenty of fighters but few of which has the ability to offer an interesting interview to the media and to put out content that fight fans aren’t growing bored with hearing. Espinosa knows the fight scene in New Mexico is in a very unhealthy state at this time and that interview answers of generic nature won’t benefit his exposure going forward in his career. He isn’t offering the same answers dozens of fighters offer, “I train very hard”, “My opponent is game and tough”, “It is going to be a tough fight”. Espinosa doesn’t have an exact answer as to why the fight scene is in bad shape in such a noted combat State but he has some ideas. The over saturation that Espinosa speaks of is also a reason for poor fighter pay in this area. Fighter pay is a topic of passionate opinion for Espinosa and he pulls no punches when addressing the issue. A point of agreement between Espinosa and I concerning the topic of the poor state of MMA in the area is that promoters somewhere along the way forgot what their job is in relation to the shows they promote. I go back to the simple ideology of “promoters promote, fighters fight, consumers consume (the product)”. Hopefully for Espinosa’s sake, these things change for the better because Espinosa’s next match-up has been scheduled for July 18th in Las Cruces. He will take on Adam McGurk of El Paso in a Flyweight showdown. 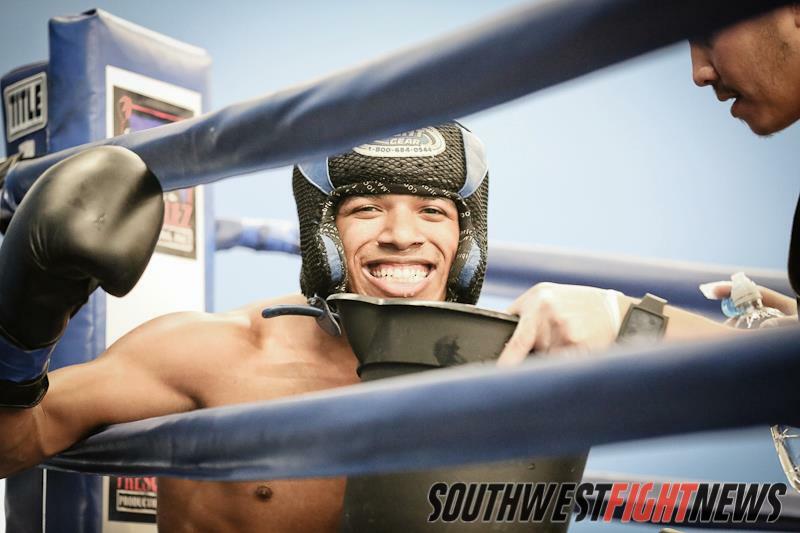 A win in July and another in September could make 2015 the year of Jordan Espinosa and with his career trajectory leading him up the proverbial ladder, it may not be long until Espinosa is the next New Mexico trained athlete to make a name for himself in the big leagues of MMA.